Think about this before you read on, Sheriff Joey Terrell said he would do this again. We’re putting drug busts over the lives of babies now. Since when are drugs and enforcing no knock raids more important than the life? 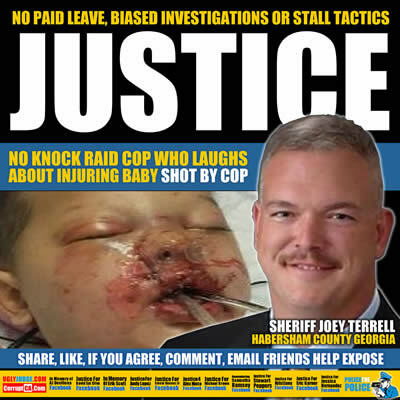 Sheriff Joey Terrell Habersham County and a deputy were shot Sunday night while responding to a domestic violence call. Sheriff Joey Terrell went to the home to help diffuse the situation because he knew the suspect. A Flash Bang uses gunpowder and a mix of ammonim and potassium in order to explode. The explosion creates more than a million candlepower of light and a deafening 170-decibels of sound. This dangerous device explode in the face of young Baby “Bou Bou”. In order to give him a chance for survival, the 19-month-old baby was put into a medically induced coma. The impact from the explosion bruised one of his lungs so badly that it is not functioning. His face was ripped open during the blast, and a laceration on his chest goes all the way down to the muscle. The doctors have on given him a 50% chance of survival. Sheriff Joey Terrell said that injuring an innocent person was the last thing they wanted, but it appears the last thing they wanted was to take the time to perform the proper surveillance. In one comment he indicates that all of the information they had on the house came from a Confidential Informant. The Confidential Informant allegedly bought drugs from Wanis Thometheva in the doorway of the home, and did not even see the inside. Sheriff Joey Terrell was shot in the arm and was released from the hospital and Deputy Bill Zigan is expected to be released from the hospital on Tuesday. A Georgia Bureau of Investigation official told Atlanta television station WSB that officers found a woman dead in the garage at the home. Investigators say the suspect in the woman’s killing is dead and a second man was found dead outside the home. Mandy Gaither the suspect in the case was a deputy at the Habersham Co. Sheriff’s Office several years. The suspect also previously worked at the Gainsville Police Department.